One of the world’s oldest, the Armenian people today is scattered across several continents and to varying degrees absorbed into various cultures, reflecting a tumultuous history replete with persecution, mass deportations, and genocide. Armenians do have a homeland, which wrested independence from the waning Soviet Union in 1991, though the Armenian republic is 1/6th the size of historic Armenia. 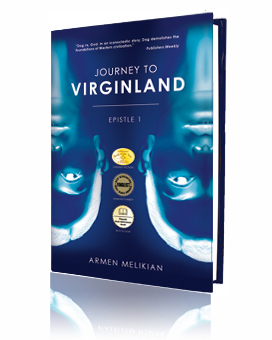 The some 6,000-year odyssey of the Armenian people – including its myths, religions, epochal creative achievements, and great failings – comes alive in Journey to Virginland, an ambitious new novel by Armen Melikian. A scholar of Armenian history, language, and mythology, Melikian unlooses a scathing, multilayered critique of the Armenian people, seamlessly weaving his ideas and commentary into the storyline of his fast-paced novel. In his highly contextualized critique of the Armenians, Melikian zeroes in on the mores, ideologies, and power systems that continue to define an Armenia mired in social inequity and provincialism, and a diaspora stuck in the past and straggling with dreams of a “paradise postponed” – that is to say, preserving what the Armenians have inherited in terms of tradition and orthodoxy rather than creating a more dynamic paradigm. Through his unique vision of the Armenian people, Melikian proposes a genuinely revolutionary path to positive change, with a tough love that is sobering and exhilarating in equal measure. Looking for a unique book about the Armenian people? Get your copy of Journey to Virginland today!